The first time I was in Catalonia, I don’t think I tasted a single local specialty. I was seventeen and stranded in Barcelona for two weeks, awaiting a shipment from my parents that included the Eurail pass I needed to travel around Europe for the next three months. Barcelona was supposed to be just a quick stop on my way out of Spain, a place to gather my wits before heading out to experience the wide world of Europe that lay beyond the confines of the small town in the Basque Country I’d called home for the past nine months. To ease the transition to total independence I had accepted an offer to stay with some friends of my host family in Barcelona. While shacking up with locals is usually the ideal way to experience whatever delicacies a region has to offer, in this case it unfortunately wasn’t, as the locals in question were a Syrian-American couple more interested in feeding me baba ganooj and enchiladas than introducing me to anything Catalan. The fact that I was on a skinnier-than-shoestring budget didn’t help my food situation either. Even though I wasn’t paying for accommodation or most of my meals while in Barcelona, my stay in the city wasn’t figured at all into my overall travel plan, and I knew that spending too much there might force me to miss something unmissable later on. I had, after all, intended to be there only two or three days, but somehow that absentee shipment from my parents stretched a short stopover into an endless waiting game. So I counted out the pennies for my daily ration of bread, cheese and chocolate, and wandered the city streets alone, biding my time until I could finally leave Spain and get on with the real business of traveling. It was another three years before I got a taste of what I had missed in Barcelona, and even then, it was barely a taste. Manuel and I had just met, and sensing that this was a guy I wanted to travel with for many years to come, I followed him back to Germany, where (never content to sit still) we hopped in his rusty old Citroën deux chevaux and drove all the way to Spain. We somehow ended up at the seaside resort of Tossa de Mar, a jewel of a village on Catalonia’s rugged Costa Brava, and checked ourselves into Tossa’s spacious and reasonably-priced campground. Despite sleeping in a tent, money was pretty tight, and most nights spaghetti and canned vegetables warmed on our little butane stove were about as good as it got. Our last night there, however, we managed to scrape together enough to visit one of the seafood restaurants lining the beachside promenade. There, opposite the shimmering black of the Mediterranean we ate a magnificent paella, overflowing with shrimp and mussels that had been pulled from Tossa’s offshore depths that very morning, and washed it down with a big carafe of local red wine. That paella stands out in my memory as one of the best things I’ve ever eaten, though in all honesty I can’t be sure that it wasn’t just the combination of warm sea breezes and young love playing tricks on my tastebuds. Then finally two years ago, we went back to Catalonia, and this time we got it right: we went there to eat. We spent five belly-busting days in Barcelona, confirming beyond a shadow of a doubt that not only is Catalonia’s capital one of the world’s greatest food cities, with restaurants both traditional and modern providing some of the most consistently amazing food at some of the world’s most reasonable prices, but that Catalan food is indeed a great cuisine in its own right, or as Colman Andrews proclaimed in his 1988 book Catalan Cuisine, "the last great undiscovered cuisine in Europe". The really unbelievable thing is that it is still undiscovered. Indeed, not much has changed since 1988; Catalan cuisine is still languishing in obscurity, conspicuously absent from the pages of magazines that still find plenty to say about the cuisines of Provence and Tuscany. Spanish cuisine (read: tapas, tapas, tapas) has had its few minutes of fame as the darling of the world’s gastronomic trendsetters, but while there may be a few shared dishes and techniques, Catalan cuisine and the other cuisines of Spain are as different from each other as, well, regional cuisines all around the Mediterranean. Everyone knows about El Bulli, of course, and thanks to one uber-innovative Catalan chef everyone has heard of foams and powders and skinless ravioli, but how many people have heard of esqueixada, suquet, samfaina and coca? How many know that traditional Catalan thickeners include nuts, bread and chocolate, or that in this part of Spain, blending garlic and olive oil with honey and apples is the work of grandmothers rather than envelope-pushing, cutting-edge chefs? And then of course there’s fideuà, truly one of the overlooked glories of the Catalan repertoire. This poor cousin of paella, assembled from toasted noodles and seafood, has been sustaining Valencian fishermen for generations. It was originally prepared on board their boats in porcelain washbasins with whatever dregs the fishermen wouldn’t be able to sell; nowadays, of course, it’s gone considerably more upmarket and people stick all manner of fancy things into it. 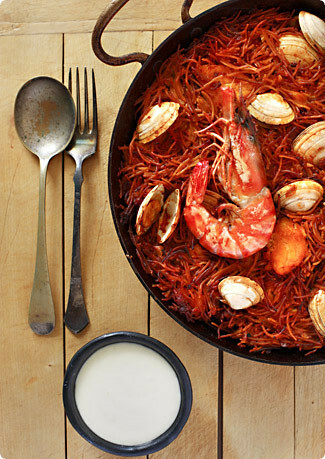 No matter how humble or exalted the ingredients, though, this dish really packs a flavor punch: slowly caramelized onions, tomatoes and garlic – called a sofregit in Catalan – provide a backbone for the rich, saffron-laced stock, the supple, nutty noodles, and of course the stars of the show, plump chunks of your favorite sea critters hiding underneath the crusty top. With top-quality ingredients this would be rhapsody-inducing enough, but those clever Catalans take it one step further and pair this masterpiece with another, namely a hearty dollop of their gutsy garlic-and-oil emulsion called allioli, a sauce so exquisite it would make 20-year-old Birkenstocks taste good. And all exaggeration aside, any cuisine that can boast a feat like that surely deserves to be recognized sooner rather than later. ads and shells – these make an incredibly flavorful stock and improve the complexity of the finished dish enormously. If you can’t, though, just get ahold of the best fish stock you can – no bouillon cubes allowed!! Also, many people have asked me about paella pans over the years, so I’ll tell you my preferences here, in case you happen to be in the market for one. The cheapest ones tend to be made from carbon steel, and while they work fine, they rust easily if food is left in them and/or they are not seasoned properly. I much prefer enamelled pans, which are affordable, don’t rust and are much easier to clean and maintain. Nonstick pans are fine too, though they prevent that nice bottom crust from forming on the rice or noodles; heavy-gauge stainless steel is generally considered to be the best, but these also tend to be the most expensive. As for size, I used to have a 34cm (13-inch) pan, and found it a little small for the quantities I generally wanted to cook; now I use a 38cm (15-inch) pan and find it perfect for dinner parties of 4-6 people. If you’ll regularly be cooking for more than that, go for something even bigger. 1. Begin by toasting the pasta. Heat 2 tablespoons of oil in a 15-inch (38cm) paella pan or a large heavy (ovenproof) skillet over medium heat*. Add half the noodles and cook, stirring constantly, until they have turned a more or less uniform toasty brown. Watch them carefully as they burn easily. Remove from the pan to a large bowl, making sure none are left in the pan. Add 1 more tablespoon oil to the pan and repeat with the other half of the noodles. Remove these to the bowl as well. 2. Peel the shrimp, reserving their shells and heads (leave a couple with their shells and heads on to garnish the fideuà, if you like). Heat another 2 tablespoons oil in the paella pan or skillet over high heat and when hot, add the shrimp (both peeled and unpeeled) and half the garlic. Sauté just until the shrimp has turned pink, about 1 minute. Remove from the pan and set aside. 3. Make the stock. In a large, heavy-bottomed saucepan, heat 1 more tablespoon of the oil over medium-high heat. Add the shrimp shells and heads and stir until pink and fragrant, 2-3 minutes. Add the fish stock and saffron, bring to a boil, reduce the heat and let simmer uncovered until the stock has reduced to 6-7 cups, about 30 minutes. Before using, strain out the shrimp shells and taste for seasoning – it should be very well seasoned but not unpleasantly salty. Add more salt, or dilute with a bit of water, as necessary. 4. Meanwhile, preheat the oven to 400F/200C. Heat another 2-3 tablespoons oil in your paella pan or skillet over medium heat. Add the onions and cook slowly, stirring frequently and lowering the heat as needed, until they have softened and caramelized, about 25-30 minutes. Add a bit of water if they look in danger of burning. Add the tomatoes and continue cooking until the tomatoes and softened and caramelized and both onions and tomatoes seem to have melted together, about another 10 minutes. Add the remaining tablespoon of garlic and the paprika and stir until fragrant, about another minute or two. 5. Add the toasted noodles and stir gently to coat with the onion mixture. Add about 4 cups of the strained fish stock, stirring well to distribute everything. Using multiple burners and rotating the pan as necessary, bring the mixture to a boil over medium heat. Nestle the cooked peeled shrimp, drained clams, and fish pieces in the noodle and stock mixture. Add a bit more stock if there’s not enough to mostly cover the seafood. Let cook on the stovetop, rotating the pan as necessary to heat everything evenly, until the noodles are getting al dente and most of the stock has been absorbed, about 7-10 minutes. 6. Pour another two cups of stock into the pan, arrange the whole (shell-on) jumbo shrimp decoratively on top, and transfer to the oven. Bake until the top of the noodles are crusty and most of the stock has been absorbed, about 10-15 minutes. Discard any clams that haven’t opened. Serve immediately, accompanied by plenty of lemon wedges and a large bowl of allioli. *If you are going to be using a paella pan, to make things easier on yourself (particularly if your pan is quite large) you can perform all the steps through the making of the sofregit (step 4) in a skillet (doesn’t need to be ovenproof), then transfer everything to the paella pan for the final stovetop and oven cooking. This reduces the amount of time you’ll spend juggling the pan over multiple burners trying to get everything cooked evenly. Real allioli is made by pounding garlic and salt in a mortar and slowly stirring in olive oil until an emulsion is formed. It can be tricky, and truth be told I like this much simpler version just as much. If you want to try your hand at the real thing, there’s a good recipe here; for this version, just remember to start it at least an hour before you plan to serve it. Mix everything together and refrigerate, covered, for at least an hour to allow flavors to blend. This keeps a couple of weeks in the fridge. Hi Melissa,Long time lurker, first time commenter. What a timely and delicious post! I’m heading to Barcelona at the end of this week. It’ll be my 2nd visit, and this time, I’m definitely focusing on the Catalan cuisine. Thanks for your recommendations! Love your travels and this dish looks heavenly! dear melissa, your fideua looks drop-dead gorgeous! it’s a recipe i’ve long longed to make, which of course makes it but one in a very long list (on different scraps of paper of course ;-)). but thanks to your lovely post, it’s now moved right to the top of said list! Yummy and elegant looking, too. Quite different from the Mexican inspired version I’ve made a few times, but the crusty noodle thing is a lovely common element. great photo! First time commenter here, long time lurker as well. Your post had me thinking of when my boyfriend and I went to Barcelona and the Catalan countryside some years ago. While we didn’t have fideua, we had all sorts of paella, arroz negre, and tapas in between the sightseeing and other things we did. I’ll have to make this now; it looks absolutely fantastic. Fideua is SUCH a delicious dish. And what a revelation, that you can cook spaghetti like that, and have them get infused with all that briny goodness. Fantastic. Your photo is, as usual, stunning. I love that bright red color! Will have to try your version very soon indeed. With a few pairs of 20-year-old Birkenstocks gathering dust in the back of my closet, I’m almost tempted to test your theory! But seriously, fantastic post and wonderful recipe. Simply beautiful! I’ve been there before and now I can’t wait to get back there to work. Catalunya (probably Barça) is on my planned work experience route after I leave college. It seems Barcelona needs a few tries before it catches on, sometimes. We spent 3 days there, after 4 days in Madrid, and did not find the comparison to the Catalans’ advantage. Until we returned some years later and really go to enjoy the place and all its fare. Thanks for this mouth-watering post. Ohhh I wish I had read this post 10 days ago! I came back last night from Barcelona and would have loved to pay a visit to the restaurants you recommend. I did have a great time, though, and ate excellent food and absolutely fell in love with the city! I’ll try making fideua soon, thanks! Wow, that looks great. I bought The New Spanish Table and am just starting to get into Spanish cuisine. I had a bad food experience when I was in Spain a few years ago and have been staying away from it for a while. But I love all the ingredients and I’m excited to get make some more recipes. I bought some whole wheat fideo noodles on my last trip to Barcelona and haven’t touched them. But I did have the best of intentions. Perhaps this was just the push I needed. Time to haul out the mortar & pestle as well! Thanks for a truly new recipe for me. Barcelona has become a fairly hip place for Eurpeans these days and I think tapas still has its attraction. But an old fashioned, rustic meal — just like the locals made it before anything was cool, that’s a treat. Lovely post. Thanks for this engaging post. I’m not intimately familiar with Catalan cuisine but am intrigued by the flavor combinations. they sure eat well over there, don´t they? I love how they scatter raisins and pine nuts just about everywhere. lovely post. Reading your blog is a passion of mine as our passions are similar. I love cooking and have been a chef for 10 years. Travelling is my second passion and was lucky enough to find ajob as a personal chef to billioniares which takes me all over the world for free!!! I havn’t sampled too many culinary delights in Scotland, sill i am sure you were prepared for that having lived in Ireland! The treats are there but require a deal a searching, i guess that makes them even sweater when you do actually find them! !keep up the good writing and check out my video recipes to prove that at least one ‘Celtic" chef is worth noting! I’ve only had the pleasure (and luck) to spend three days in Barcelona. It is a remarkable city made all the more special by its cuisine. The rest of Catalonia remains a mystery to me. Also, how do fideo noodles differ from Italian dried pasta noodles? Do you feel the quality of the dish is diminished by the substitution? Rob – There’s no difference in quality between the two kinds of noodles. Fideos are handy if you can find them just because they’re already the right length – breaking up your own vermicelli or angel hair might lead to a shaggier looking fideua, but the taste will be as good! Hi Melissa, I’ve read you for a long time, but I’ve never commented until now. Since Catalan food is a bit of an obsession of mine, I thought now would be the best time to commend you on this post, and your whole blog. I actually made your recipe and it’s among the very best I’ve tried. The only variation I made on it was that I grated the tomatoes instead of chopping them. As for the noodles, I found a pretty good source. http://www.zingermans.com/Product.pasp?Category=&ProductID=P-FIDThese are good enough to hold me over between trips to Barcelona, and sneaking in Fideos La Ardilla.Thanks for this recipe and for giving Catalonia a space in your wonderful blog. Why do English speakers say "fiduea" when it is FIDEUA from FIDEO?I have seen that spelling error even in edited books.